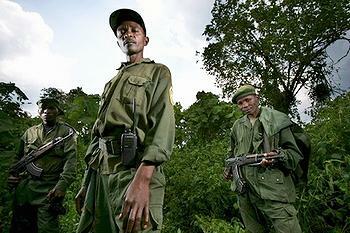 VIRUNGA NATIONAL PARK, Democratic Republic of Congo, January 24, 2011 (ENS) – Three rangers and five Congolese soldiers were killed this morning in an attack on their patrol vehicle in Congo’s Virunga National Park that park officials are calling the worst attack on patrols in over a year. The group was on patrol along a road that passes through center of the national park in an attempt to secure a safe passage for members of the public who visit the park to see rare gorillas and other wildlife. A rocket-propelled grenade hit the group when it fell into an ambush one kilometer north of Mabenga, just inside the park border. The attackers, who escaped on foot, are believed to be FDLR Rwandan militia, an illegal movement thought to include the perpetrators of the Rwandan genocide in 1994. Officials say the attack was likely carried out in retaliation for the destruction of two FDLR Rwanda camps by park rangers in December 2010. Often referred to as the FDLR after its original French name, the Forces democratiques de liberation du Rwanda, this is the primary remnant Rwandan Hutu Power rebel group in the eastern part of the country. The attack took place about 100 kilometers north of the city of Goma. Park rangers and regular army units have been working together to secure the area within the national park known to be heavily frequented by FDLR militia. Virunga National Park, Africa’s oldest national park was established in 1925 and has been a UNESCO World Heritage Site since 1979. Encompassing 7,800 square kilometers in eastern DR Congo, the park is managed by the Congolese Wildlife Authority, the Institut Congolais pour la Conservation de la Nature, ICCN. “We are deeply saddened by the loss of our colleagues who were killed in their efforts to protect the public from illegal armed groups,” said Virunga Park Director Emmanuel de Merode. Some 400 park rangers protect Virunga National Park, which is in a region affected by a 12-year civil war and political instability. “One-hundred-thirty of Virunga’s rangers have died since the beginning of the war in 1996, but the park’s staff remains determined to protect the park,” said de Merode. Over 160 rangers have been killed in the last 10 years protecting the five parks of eastern DRC, and rangers worked throughout the civil war, rarely receiving a salary. 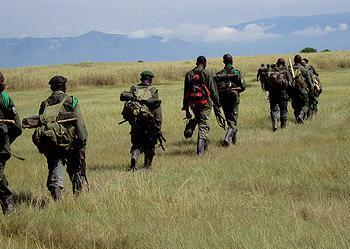 The rangers killed today will be buried tomorrow morning at the park cemetery on the banks of the Rutshuru River. Three rangers who were injured in the attack are in critical condition and have been taken to Rutshuru Hospital. Today’s attack took place just next to the site where a UN peacekeeper was killed last year, de Merode said. The park is inhabited by 200 of the world’s approximately 700 wild mountain gorillas and a small population of eastern lowland gorillas, chimpanzees, forest elephants and rhinos, among other wildlife. Poaching, wildlife trafficking and habitat destruction remain the key threats to the survival of the wildlife in Virunga National Park.